As the world’s number one vacation destination, Orlando has yet again beaten its own impressive visitor count. The Orlando Business Journal reports a record 66.1 million people visited the Orlando area in 2015 – a 5.5% increase from the previous year. With this incredible growth comes a tremendous need for new accommodations for visiting tourists. Timing couldn’t be better to purchase a vacation home residence at The Grove Resort & Spa. This impressive vacation resort destination featuring 878 fully furnished two- and three-bedroom residences is ideally located just five minutes from the Walt Disney World® Resort. Unique in its location and design, The Grove is the perfect combination of secluded privacy and unmatched location for easy access to Orlando’s world-famous theme parks. 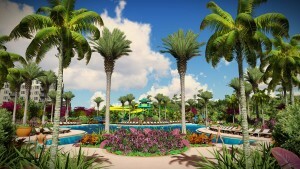 The Grove Resort & Spa will feature a world-class, family-friendly water park and amenity package with the first surf simulator at any Orlando vacation home community, a lazy river winding more than 725 feet, three swimming pools known as The Springs, a large zero-entry pool and dining options that include a full-service restaurant and bars. This is the ideal opportunity to invest in the exciting growth Orlando continues to experience. Ownership at The Grove comes with a multitude of benefits and choices to make your vacation home work for you. While you’re away you have the option to place your home in the hotel rental program to offset your own costs, making your purchase an excellent value. The staff and on-site management team are dedicated to providing excellent service, both to you and your guests. Imagine a vacation home with no upkeep. Just arrive, enjoy and leave. Everything else is taken care of you. It’s the turnkey lifestyle that so many people are looking for, but now it returns the favor twofold by generating cash flow from the carefully managed rental program. Sure, other vacation home properties offer their owners the ability to rent out their residences while they aren’t there. What sets The Grove Resort & Spa apart is that the developer has put an experienced and well-respected property management company in place for you. Google “Orlando property management companies” and you’ll get thousands of results. How do you know which is right for you? What’s their track record? Will they be around a year from now? Will their service keep your renters coming back? Will they maximize your revenue and minimize your expenses? We’ve taken the guesswork out of renting your vacation home by putting a respected property management company in place to handle all the details for you. Benchmark Hospitality International, with nearly 40 years of hotel development and management experience and 5,000 rooms and 40 resorts, hotels and conference centers globally, will manage the property as member of its signature Benchmark Resorts & Hotels portfolio. Benchmark’s involvement in hotel and daily resort operations provides a convenience to owners and standard of service excellence to hotel guests. A natural choice to meet the high expectations of The Grove’s owners and guests, Benchmark is prepared to take care of everything for you and to see no detail is left unchecked. The Grove Resort & Spa is attracting global interest, with buyers from Canada, the United Kingdom, China and South America, to name a few. When investors and owners research the facts and compare the value, construction, location, financial backing and on-site management, its easy to see why The Grove has become one of the most exciting vacation home projects in Orlando and beyond. The Grove Resort & Spa is expected to open in Orlando, Florida in November 2016 as a sprawling 110-acre vacation home resort located just a five minute drive west of Walt Disney World®. Set on Lake Austin and amid a portion of Orlando’s conservation grounds, The Grove will become a sanctuary from the boisterous pace of the outside world, neighboring theme parks and entertainment centers. 878 two- and three-bedroom fully furnished condominium residences are available for purchase starting from the $250,000s. Owners have the option to place their residences in the hotel rental program while they are not in use, or take advantage of the developer leaseback program. The resort’s feature-rich collection of amenities will deliver the luxuries of a full-service resort. Three swimming pools and the Surfari Water Park will be a focal point of The Grove experience, with a zero-entry resort pool, water play island, a lazy river stretching more than 725 feet, and the first surf simulator at any Orlando vacation home community or hotel. Owners and guests will also enjoy a selection of water sports at the resort’s lakeside dock, an intimate spa, fitness center, and a children’s game room. Dining options will include the indoor/outdoor Valencia restaurant, Longboard Bar & Grill and Springs Bar & Grill at the pool areas; with additional food options available at the large scale grab-and-go Pickings Market. flexible meeting space will be available for weddings, family reunions, and other meetings and special events. The Grove Resort & Spa is managed by The Woodlands, Texas-based Benchmark Hospitality International as a member of their signature Benchmark Resorts & Hotels portfolio. The Grove Resort & Spa is located at 15665 Grande Palisades Blvd. in Orlando, Florida. 844-901-1122. For more information, please visit www.groveresidences.com.